42 x 50, pdf (1.19 MB). 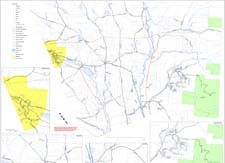 The Burke Town Map is a general town map showing US and Forest Highways, Town Roads (both paved and unpaved), Rail Lines, and Pipe Lines. This map also shows various building types, including Residential, Commercial, Industrial, Farm, Public, Schools, Churches, Fire Stations, and Communication Towers. 42 x 50, pdf (17.9 MB). 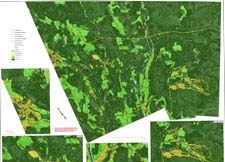 The Burke Land Cover Map shows land parcels, developed land, open land, forested land, ponds and rivers, and roads in the Town of Burke. Please Note: this file is extremely large and may take extra time to download. The zoning maps below highlight the various zoning areas in the Town of Burke, including Agricultural Resdiential I, Agricultural Residential II, Resort, Village Mixed-Use, as well as Parcels, Lakes, Ponds, Rivers, Roads and Building Types. 42 x 50, pdf (1.88 MB). 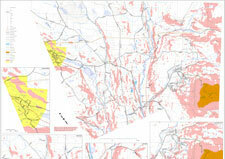 The Natural Resources Map is a contoured map which includes Wetlands, Deer Wintering Areas, Steep Slopes, boundaries for the Darling State Forest, and Village Areas. It also depicts land parcels, Roads, Rail Lines, Pipe Lines, and various building types (Residential, Commercial, Industrial, Farm, Public, Schools, Churches, Fire Stations, and Communication Towers).